There is much diversity among names for Australian Cattle Dogs. Among the most popular ACD names are those of Australian origins. A few fitting male ideas are Wally, Boomer, and Joey. Common female Australian names include Kylie, Barbie, and Sheila. The breed commonly comes in two coat colors. The ones with a brown-on-white coat are often referred to as Red Heelers. Typical names for Red Heelers are Garnet, Ruby, Auburn, and Cinnamon. Those with a black-on-white coat are known as Blue Heelers. Popular Blue Heeler names include Skye, Sapphire, Blue, and Azure. The term heeler comes from the breed’s approach to herding that involves nipping at the heels of cattle. 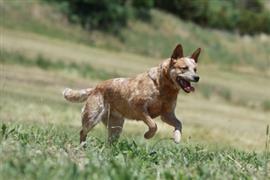 As with other cattle dogs, the ACD is a high-energy breed. A few names for high-activity dogs include Bolt, Kinesis, Fidget, and Nitro. To ensure your dog never runs out of gas, we have also included several names inspired by chains of gas stations. Favorite choices include Valero, Shell, and Tetco. Some of our pages will contain a subcategory. A subcategory is a slightly more specific grouping than the main topic of the page. For a subcategory, we will include a separated table of names and corresponding descriptions. An example of a subcategory of Red Dog Names would be 'Dog Names Inspired by Red Wines'. If you have any subcategory ideas for the Australian Cattle Dog Names page, we would love to hear them. Use the form below to submit your ideas.